Who’s ready for kids classroom holiday parties? Did I just see you wince a little bit? Don’t worry! We’re going to make this painless and even save you some money in the process. Our Christmas Tree Applesauce Snacks are the perfect healthier classroom snack idea. We have a tendency to like to create holiday class snacks that usually include me using the hot glue gun. And when I say we, I really mean I. I always end up regretting it in the end, too, because I’m usually missing my fingerprints on at least 3 different fingers by the end of my crafting adventure. I also have a tendency to not think about the price that I’m paying for each little snack cup either. I just usually come up with a shape that I want to use to create my holiday character (reindeer, penguin, grinch, etc.) and I then go find a snack that comes in that shape. Not really the most frugal idea. Not this year though! I headed off to Dollar General to save myself some money! I was thrilled to see that Dollar General is carries both Mott’s® Applesauce Pouches and Apple Juice. Did you know that Dollar General carries the lowest price of Mott’s® 100% Original Apple Juice nationally? Mind blown, right?! Now, not only can I make the applesauce pouches conform to the shape that I need, but they are a much healthier option than my usual jello or pudding that I choose. While I was at Dollar General I grabbed all the supplies that I would need for the Christmas Tree Applesauce Snacks I had envisioned in my mind. 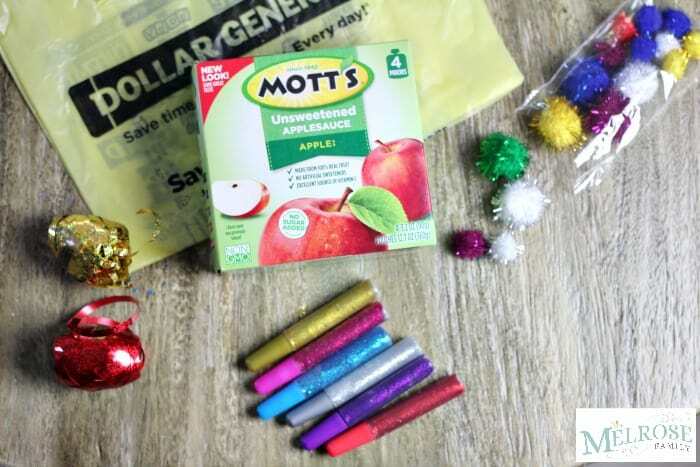 You just need the Mott’s Applesauce Pouches, glitter ribbon, sparkle pom poms, tape and glitter glue. Clearly, I have a thing for glitter. The best part, though, was that there was no need for me to lose any fingerprints in the making of these Christmas Tree Applesauce Snacks. So score for saving money and fingerprints! 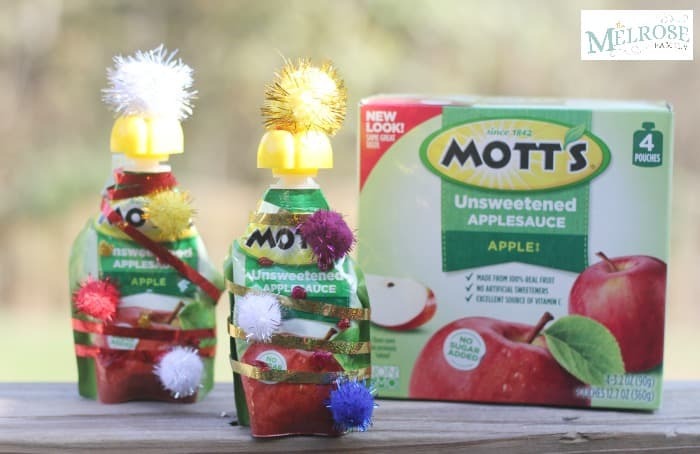 In order to hold the glitter ribbon around the applesauce pouches, I simply taped them down and wrapped them around the applesauce pouches with the top edges folded in so that they were in the shape of a tree. The great part about the decorating of the applesauce pouches is that because I’m not using hot glue, but glitter glue instead, my girls were able to help with the craft. They globbed on dots of glitter glue and then added a couple of small sparkle pom poms as Christmas ornaments to the tree. 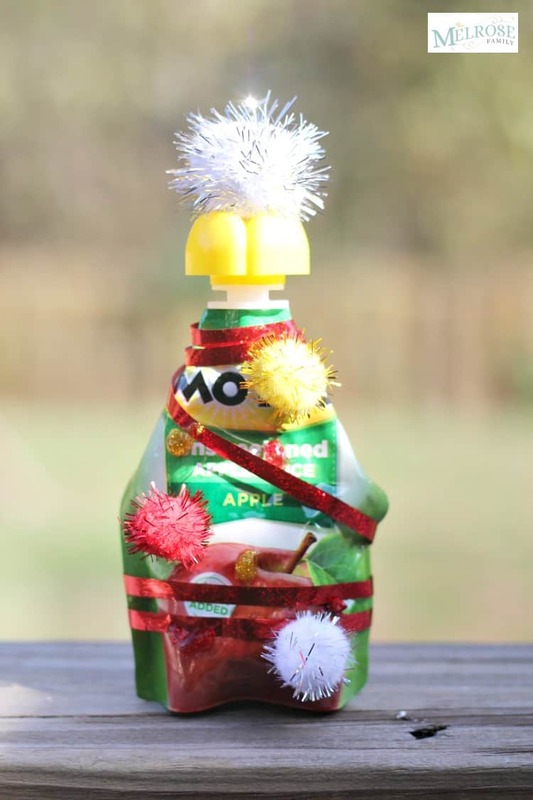 The finishing touch was the large sparkle pom pom that was attached with glitter glue to the top of the applesauce pouch. My girls were thrilled with the work. Avery, my four year old, said, “My friends are going to love these. I bet they even give it to Santa because it’s so pretty.” Now, clearly her standards are not that of my almost eight year olds, who rolled her eyes in her usual wanna-be-teenage fashion, but all in all we were pretty pleased with the outcome of our Christmas Tree Applesauce Snacks. 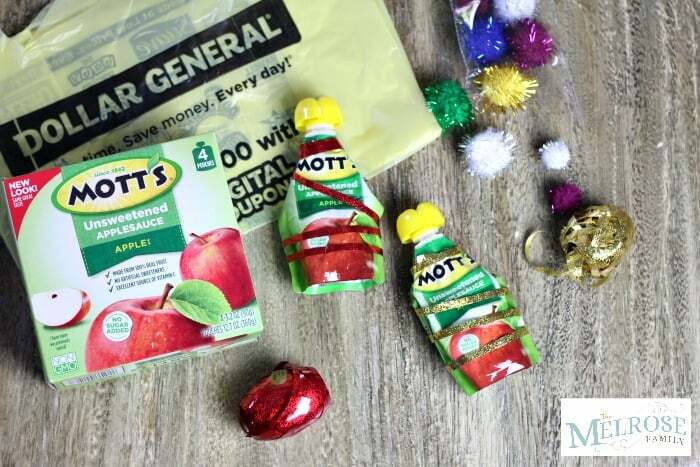 Check out this site with a variety of ways to use Mott’s during the holidays!